Asian stocks bounced on Monday after three straight losing sessions, tracking a firmer Wall Street, while the dollar was capped by tensions on the Korean peninsula and doubts that the Federal Reserve will hike interest rates again this year. Spreadbetters expected the upward momentum for equities to continue in Europe, forecasting Britain’s FTSE to open 0.2 percent higher, Germany’s DAX to start 0.25 percent higher and France’s CAC to open up 0.3 percent. U.S. stock futures rose 0.3 percent, suggesting a higher open later in the day. Asian markets were largely unfazed by a slew of activity data from China which was softer than forecast, though still largely solid. The world’s second-largest economy had been widely expected to lose a bit of steam in coming months after a surprisingly strong first half. But economists do not expect a hard landing, with the government keen to ensure stability ahead of a Communist Party leadership reshuffle in the autumn. 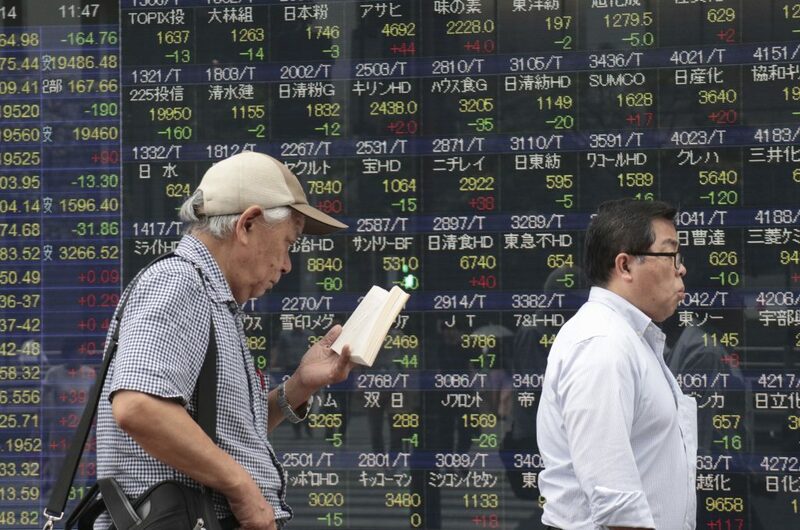 MSCI’s broadest index of Asia-Pacific shares outside Japan rose 0.8 percent. It had lost 3 percent over the previous three sessions as tensions escalated between the United States and North Korea. Australian stocks rose 0.75 percent and South Korea’s KOSPI climbed 0.6 percent. Hong Kong’s Hang Seng was up 0.9 percent and Shanghai added 0.7 percent. Geopolitical risks were expected to remain a key theme for the global markets in the near term, as North Korea celebrates Liberation Day on Tuesday to mark the end of Japanese rule. Investors also braced for tensions ahead of Aug. 21, when an annual joint U.S.-South Korean military exercise is due to begin. “Due to caution towards a further escalation in tensions over North Korea, U.S. yields and equities are expected to decline and the yen is likely keep appreciating this week,” said Masafumi Yamamoto, chief forex strategist at Mizuho Securities in Tokyo. Japan’s Nikkei bucked the trend and fell 1 percent as a stronger yen overshadowed much better-than-expected second-quarter economic growth. “Once geopolitical risks settled down, investors will likely revisit the fact that Japan’s fundamentals are strong,” said Hikaru Sato, a senior technical analyst at Daiwa Securities. The three major U.S. stocks indexes snapped three days of losses and ended higher on Friday, as investors bet on slower U.S. rate hikes following weaker-than-expected consumer price data. But gains were muted by increasingly aggressive exchanges between Washington and Pyongyang. U.S. Treasury yields, which already declined on the North Korean concerns, fell further on Friday on the soft U.S. consumer prices data. The benchmark 10-year Treasury yield touched 2.182 percent on Friday, its lowest since late June, before pulling back a little to 2.204 percent on Monday. Friday’s data showed the U.S. consumer price index edged up just 0.1 percent last month after it was unchanged in June. Economists polled by Reuters had forecast the CPI rising 0.2 percent in July. The dollar index against a basket of six major currencies crawled up 0.1 percent to 93.145 after it slipped about 0.4 percent on Friday. The greenback rose 0.4 percent to 109.585 yen after slipping to 108.720 on Friday, its weakest since April 20. The yen showed little reaction to second-quarter gross domestic product data which revealed that the economy expanded for a sixth straight quarter led by private consumption and capital expenditure. While growth was faster than expected, accelerating to a 4.0 percent annualized rate, it is not expected to nudge the Bank of Japan into dismantling its massive stimulus program any time soon, as inflation remains stubbornly weak. The euro was flat at $1.1815. Crude oil prices dipped following data showing a slowdown in Chinese refining activity growth. Brent was 9 cents lower at $52.01 a barrel. Gold hovered near a two-month high, benefiting from the U.S.-North Korean tensions and Friday’s weak U.S. inflation data. The dollar’s recent weakness was also seen to be helping gold. Spot gold was a shade lower at $1,287.51 an ounce after reaching $1,291.86 on Friday, its highest level since June 7. Other precious metals such as silver and platinum were also buoyant.